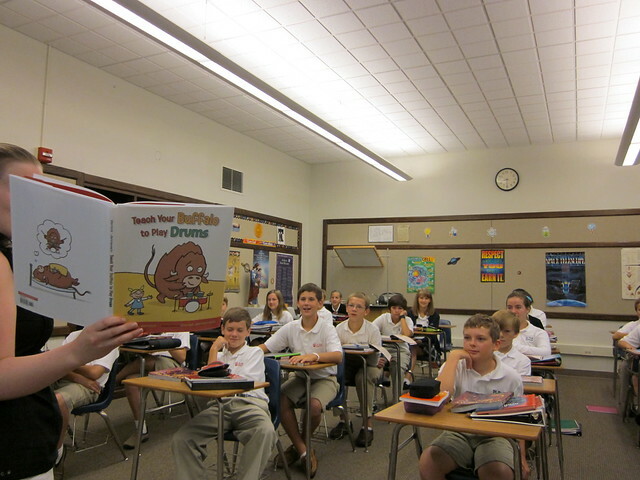 I have said on this blog many times, but it bears repeating, that I love reading picture books to my junior high students. Most of the time I read them because that particular book has an important lesson that I want them to "get" and therefore use as a journal topic. Sometimes though, I just read them for fun. One such book that I read for fun was Is Your Buffalo Ready for Kindergarten? It was such a hilarious premise and had the most adorable illustrations, that I just had to read it to them for no other reason than I loved it and wanted to share it with them. Well it turns out, those sixth, almost seventh, graders that I read this book to back in June LOVED IT! When they found out that the sequel, Teach Your Buffalo to Play Drums, didn't come out until July, they begged me to come visit them in their seventh grade class and read it to them when the new school year started. Fantastic! Thanks so much for posting this! Aww...that's great! You know what? You sound like an amazing teacher. You're kids are so lucky to have you!